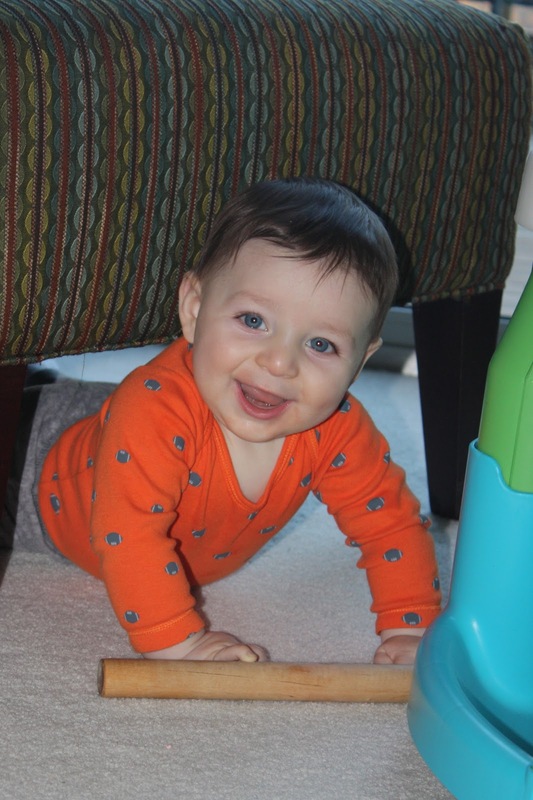 While Ben was busy having surgery over the last two weeks, Lincoln was learning to MOVE! I say this "officially" after I left the room and he was sitting in front of the exersaucer and I came back in the room and he was behind it and under the chair (pictured below)! Time to increase my baby proofing....and keep Ben's tiny toys off the floor. Here, I will document Lincoln's method to movement. He cannot crawl, but he has no trouble moving around. Then up on all fours and he crawls BACKWARDS. He also can roll both ways and can rotate 360 degrees. At this point, he can pretty much get wherever he wants to go...but I'd love to hear thoughts on how long it will be before he's crawling forward! This adoring look is simply Lincoln looking up at his brother. I love how much Lincoln loves Ben! I think he'll crawl forward when it works best for him. No need if he can get wherever he wants with his sideways and backwards mobility.